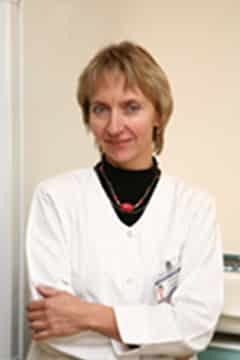 Vita Pašukonienė, Ph.D., is an oncoimmunologist, working in this field more than 20 years. She has graduated from Vilnius University faculty of Natural Sciences and defeated her Ph.D. theses in Immunology in 2003. Tumour and cell biology, tumour immunology and immunotherapy, mechanimsms of immune aging, immune mechanizms of intestinal microbiota. Management and supervision of animal experiments, project and clinical trial management, supervision of all level students, immunomonitoring of cancer patients, statistical analysis of immune response to immunotherapy, lectures for clinicians, researches and students. Microenvironment and Dose-Delivery-Dependent Response after Exposure to Ionizing Radiation in Human Colorectal Cancer Cell Lines. Stankevicius V, Vasauskas G, Rynkeviciene R, Venius J, Pasukoniene V, Aleknavicius E, Suziedelis K. Radiat Res. 2017 Sep;188(3):291-302. doi: 10.1667/RR14658.1. Epub 2017 Jul 7. Kraśko JA, Žilionytė K, Darinskas A, Strioga M, Rjabceva S, Zalutsky I, Derevyanko M, Kulchitsky V, Lubitz W, Kudela P, Miseikyte-Kaubriene E, Karaman O, Didenko H, Potebnya H, Chekhun V, Pašukonienė V. Oncol Rep. 2017 Jan;37(1):171-178. doi: 10.3892/or.2016.5252. Epub 2016 Nov 16. Evaluation of low-dose proton beam radiation efficiency in MIA PaCa-2 pancreatic cancer cell line vitality and H2AX formation. Liubavičiūtė A, Kraśko JA, Mlynska A, Lagzdina J, Sužiedėlis K, Pašukonienė V. Medicina (Kaunas). 2015 Nov;51(5):302-6. doi: 10.1016/j.medici.2015.10.002. Epub 2015 Nov 6. CD8(high)CD57(+) T-cell population as an independent predictor of response to chemoradiation therapy in extensive-stage small cell lung cancer. Dobrovolskienė NT, Cicėnas S, Kazlauskaitė N, Mišeikytė-Kaubrienė E, Krasko JA, Ostapenko V, Pašukonienė V, Strioga MM. Lung Cancer. 2015 Nov;90(2):326-33. doi: 10.1016/j.lungcan.2015.08.001. Epub 2015 Aug 4. Pašukonienė V, Mlynska A, Steponkienė S, Poderys V, Matulionytė M, Karabanovas V, Statkutė U, Purvinienė R, Kraśko JA, Jagminas A, Kurtinaitienė M, Strioga M, Rotomskis R. Medicina (Kaunas). 2014;50(4):237-44. doi: 10.1016/j.medici.2014.09.009. Epub 2014 Oct 6. Role of marker lesion when applying intravesical instillations of IL-2 for non-muscle-invasive bladder cancer comparison of the therapeutic effects in two pilot studies. Den Otter W, Van Moorselaar RJ, Jacobs JJ, Haar RT, Koten JW, Dobrowolski Z, Lipczynski W, Pašukonienė V, Characiejus D, Jankevičius F, Eidukevičius R, De Reijke TM. Anticancer Res. 2013 May;33(5):2099-105. Dendritic cells and their role in tumor immunosurveillance. Strioga M, Schijns V, Powell DJ Jr, Pasukoniene V, Dobrovolskiene N, Michalek J. Innate Immun. 2013 Feb;19(1):98-111. doi: 10.1177/1753425912449549. Epub 2012 Jun 25. Review. CD8+ CD28- and CD8+ CD57+ T cells and their role in health and disease. Strioga M, Pasukoniene V, Characiejus D. Immunology. 2011 Sep;134(1):17-32. doi: 10.1111/j.1365-2567.2011.03470.x. Epub 2011 Jun 29. Review. Prognostic significance of peripheral blood CD8highCD57+ lymphocytes in bladder carcinoma patients after intravesical IL-2. Characiejus D, Pasukoniene V, Jacobs JJ, Eidukevicius R, Jankevicius F, Dobrovolskiene N, Mauricas M, Van Moorselaar RJ, Den Otter W. Anticancer Res. 2011 Feb;31(2):699-703. Prediction of response in cancer immunotherapy. Characiejus D, Jacobs JJ, Pašukonienė V, Kazlauskaitė N, Danilevičiūtė V, Mauricas M, Den Otter W. Anticancer Res. 2011 Feb;31(2):639-47. Review. Peripheral blood CD8highCD57+ lymphocyte levels may predict outcome in melanoma patients treated with adjuvant interferon-alpha. Characiejus D, Pasukoniene V, Jonusauskaite R, Azlauskaite N, Aleknavicius E, Mauricas M, Otter WD. Anticancer Res. 2008 Mar-Apr;28(2B):1139-42. A method to estimate cell cycle time and growth fraction using bromodeoxyuridine-flow cytometry data from a single sample. Eidukevicius R, Characiejus D, Janavicius R, Kazlauskaite N, Pasukoniene V, Mauricas M, Den Otter W. BMC Cancer. 2005 Sep 22;5:122. Erratum in: BMC Cancer. 2006;6:184. Predictive value of CD8highCD57+ lymphocyte subset in interferon therapy of patients with renal cell carcinoma. Characiejus D, Pasukoniene V, Kazlauskaite N, Valuckas KP, Petraitis T, Mauricas M, Den Otter W. Anticancer Res. 2002 Nov-Dec;22(6B):3679-83.